Marine Toys for Tots Special Offer! At Professional Carpet & Upholstery Cleaners, we're getting ready for the season of giving! 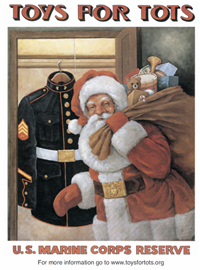 Join us this holiday season in our effort to collect toys for the Marine Toys for Tots Foundation! We will be collecting toys and offering a special discount to our customers who participate by donating a toy! Toys for Tots, 10% for You! 1) Call us to schedule your holiday carpet cleaning, any time during November and through Friday, December 14, 2012. 2) When you call, mention that you will have a toy ready for the Marine Toys for Tots Foundation collection. We are happy to be able to contribute to the efforts of the Marine Reserves, collecting toys to benefit children in our community. Call us today to schedule your carpet cleaning! Call the PROs at 651-645-0244! *Toys must be new and in original packaging, without giftwrap. For more information on toy specifics please see the Marine Toys for Tots Foundation Minnesota website. 10% off will apply to carpet cleaning services, not in combination with any other offers. Discount may not be applied to water damage services. contact us | © copyright 2017 Professional Carpet & Upholstery Cleaners, Inc. All rights reserved.